The isa-x3-b1 is designed to host up to three ISA / PCI cards. Enclosure size: 7.4 X 4.25 X 5.00 inches, 17.7 X 10.7 X 12.7 centimeters. 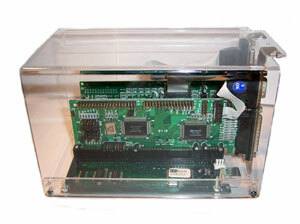 If one or more of the ISA / PCI cards are longer please refer to the ISA-X3-B2 enclosure.